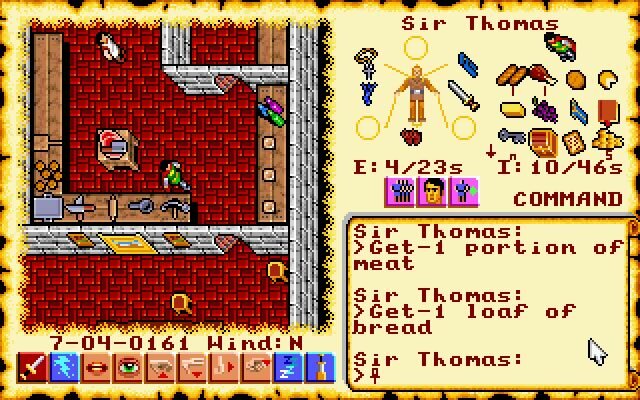 Origin Systems released Ultima 6: The False Prophet in the year 1990; it's an old fantasy rpg game, part of the Ultima series. 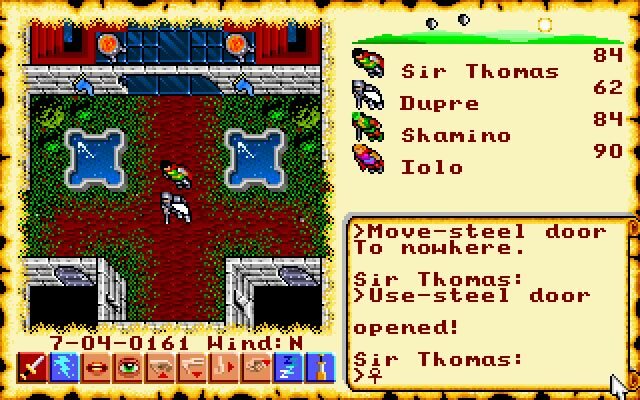 Ultima 6: The False Prophet is abandonware, runs on DOS and can be played in single player mode. It's available for download. This was one of the most ground-breaking CRPG's of it's time. Up until U6, most CRPG's followed the old trope of having you navigate your party across an over-world map, and then stand on top of icons for cities, dungeons, etc to enter them as sub-maps. U6 broke this mold by simply having a single world map, which you traversed everything on in 1:1 scale. You'd walk across the game world going from forests to swamps to towns, into homes and castles. You still entered dungeons and went to sub-maps, but they, too, were 1:1 scales. So, you could go through a dungeon and come out the other side, having bypassed a mountain range above in 1:1 scale. Combat also took place on this 1:1 scale world map, where-as other CRPG's would take you to separate combat maps. So, if you walked along and saw some enemies, you could simply enter combat and start attacking them before they attacked you, and the place you were at on the map was where you had the fight. This let you bottleneck enemies in doorways, or use other terrain to your advantage., because what you saw on the world map was going to be where you fought as well. This meant you could head out into the forest to hunt for deer, or go partake in a random encounter that would show up at a specific place all the tiem . just whatever you wanted to do for random entertainment. The game world was also alive. There was a day-night cycle. NPC's had shop, dining and sleep schedules. Sometimes you could only find certain NPC's at night, or at certain locations during certain hours of the day. U6 also became more of an adventure game, where-as previous entries in the Ultima series were more traditional RPG / Combat-oriented. U6 did have character levels and attributes, but you could easily bypass many combats and win the game without min-max'ing your levels or attributes. Rings and spells of invisibility allowed you to be completely pacifist if you chose to be. The game was more about solving mysteries and exploring, with combat simply a side item to help clear out enemies if needed sometimes. Due to spells like invisibility keeping you invisible when you attacked, it could lead to you becoming easily OP .. eg: going into a Dragon Dungeon and just being invisible while wiping out entire Dragon populations for xp. The game could be cheesed easily, but you couldn't just fight your way through it to victory. You had to use your brain and explore to really get to places and succeed. Thus, it was more of an adventure game. The game was filled with all kinds of secrets if you just explored or asked the right person the right thing. I had played it through-out high school for years, and was still finding new stuff in it.. like talking to the glassblower in Minoc and finding out he could convert map gems into OP glass swords (essentially breaking the game if you chose to do that). 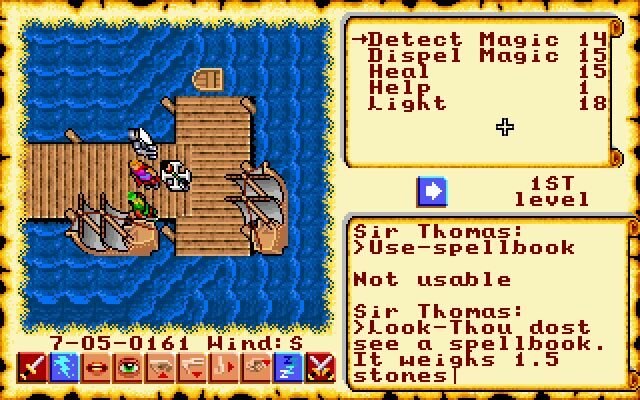 Or, finding out a party member could carry a skiff, which let you carry around instant transport for water areas. 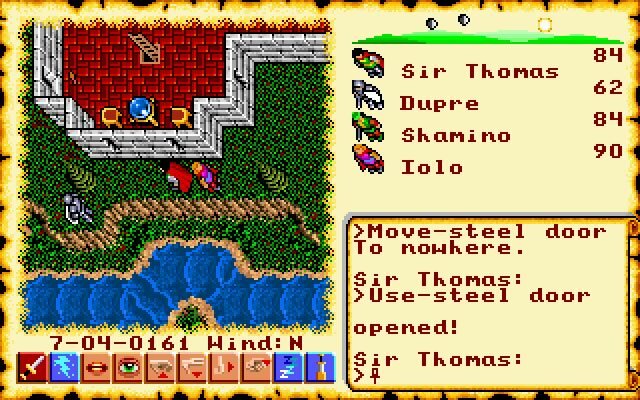 It's a top-down isometric RPG, which may not be everyone's cup-o-tea, but at the time, it was very revolutionary and had great graphics compared to other games (like the gold box SSI D&D games). It being more adventure-based also turned some people off. But, it also meant it was more story / plot-driven, as opposed to other RPG's that were just "go grind by killing random baddies in order to go kill the main foozle" paper-thin stories. 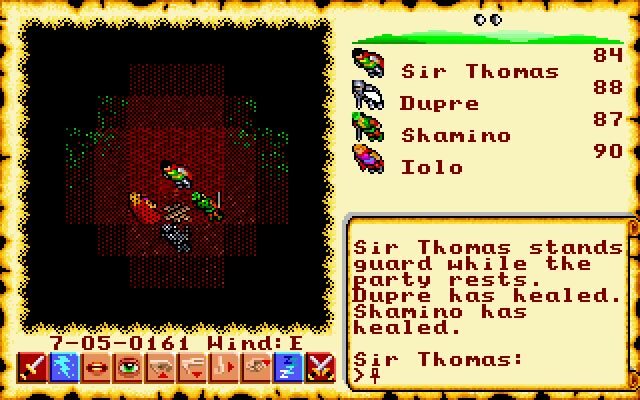 The game was just revolutionary and really pushing the concept of what we thought CRPG's could be. If you ever do decide to play it, definitely play the DOS / PC version. The SNES version has been very J-RPG'ed. By that, I mean.. prices for everything have been hyper-inflated to force stereotypical JRPG grinding to get money to get things necessary just to move forward in the plot (like spells). And, when you kill enemies, they just drop 1 item that is worth a paltry 1-2gp if sold, making it near impossible to get anywhere without massive amounts of farming. 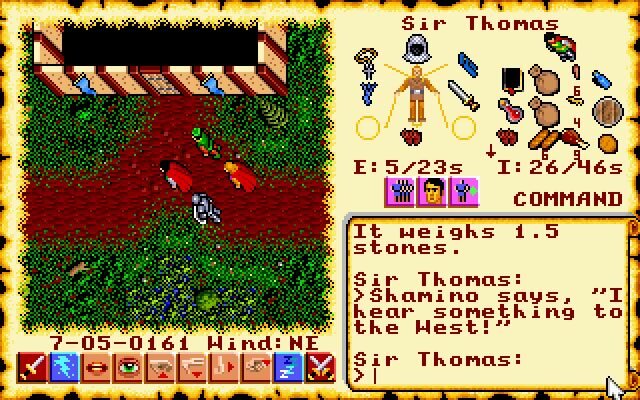 The original DOS / PC version is more robust in what you can do, and more lax in being an adventure game that doesn't force grinding. One of my all-time favorite CRPG's, and I still play it every now and then to this day. 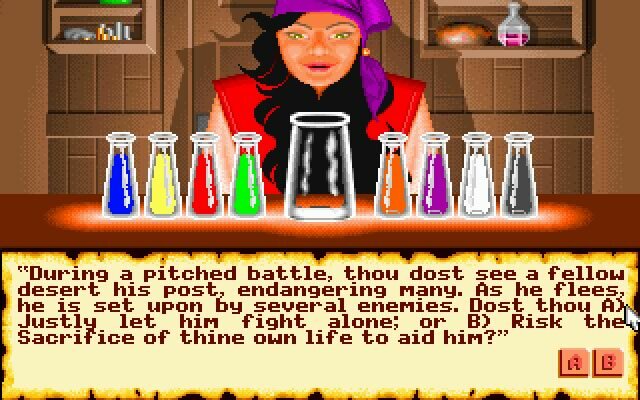 Tell others what you think about Ultima 6: The False Prophet: did you play it? Did you like it or hate it? 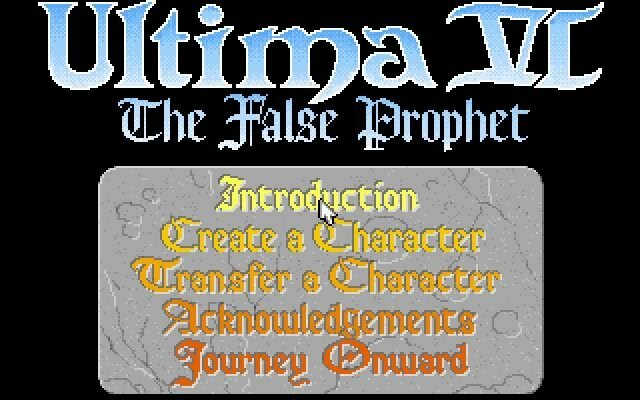 If you have problems running Ultima 6: The False Prophet, please read the F.A.Q. first. Your e-mail will NEVER be used for spam. The Tenth Anniversary Edition box is autographed by Richard Garriott and Denis Loubet and contains the 45-minute audio tape "Ten years of Ultima".